Relevance MI-192 is a novel benzamide-based compound with marked selectivity for the class I enzymes, HDAC2 (histone-deacetylase 2) and HDAC3 (histone-deacetylase 3). MI-192 is also a histone-deacetylase (HDAC)-3 selective inhibitor. MI-192 might have potential in the treatment of rheumatoid arthritis, and HDAC-selective inhibition may improve the therapeutic margin of safety. Studies in various cancer cell lines have also revealed that MI-192 might be a potential therapeutic agent for use in leukaemia. Selectivity Exhibits >250-fold selectivity for HDAC2/3 over other HDAC isoforms. In vitro applications Promotes apoptosis of leukemia cell lines in vitro. Also attenuates IL-6 production in rheumatoid arthritis PBMCs in vitro. 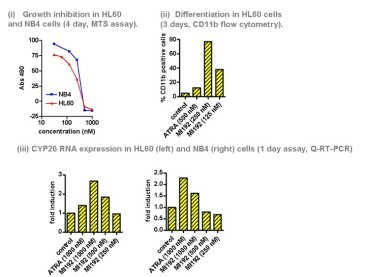 MI-192 (CRT0163458) shows potent activity in a number of cell lines tested using the NCI-60 cell panel. Leukemia cell lines: CCRF-CEM, HL-60 (TB), K-562, MOLT-4 and RPMI-8226. Colon Cancer cell lines: COLO205, HCC-2998, HCT-116, HCT-15, HT29, KM12 and SW-620. CNS Cancer cell lines: SF-268, SF-295, SF-539, SNB-19, SNB-75 and U251. When tested in culture against the acute myeloid leukaemic cell lines U937, HL60 and Kasumi-1, MI-192 induced differentiation and was cytotoxic through promotion of apoptosis. Boissinot et al. 2012. Leuk Res. 36(10):1304-10. PMID: 22818799. Induction of differentiation and apoptosis in leukaemic cell lines by the novel benzamide family histone deacetylase 2 and 3 inhibitor MI-192. Gillespie et al. 2012. Arthritis Rheum. 64(2):418-22. PMID: 21952924. Histone deacetylases are dysregulated in rheumatoid arthritis and a novel histone deacetylase 3-selective inhibitor reduces interleukin-6 production by peripheral blood mononuclear cells from rheumatoid arthritis patients.